Can Jeff Lockie Fill the Void? 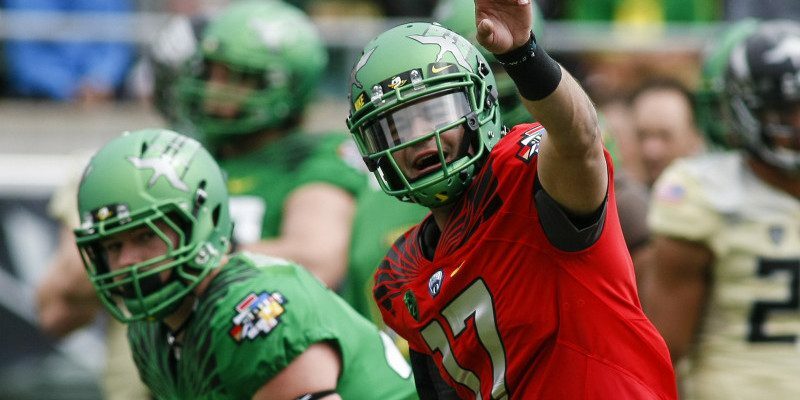 When Marcus Mariota was leading the Ducks, everything seemed fine and dandy. Last season rolled along, with much success coming for our men in green and yellow, and black and pink, and white and gray, etc. Towards the end of the season, rumors of Braxton Miller transferring to the other dominant ‘O’ were swirled around, but nothing came of it. In the weeks recovering from the devastating loss to Ohio State, the gaping hole left by Mariota became more and more worrisome for Ducks hopefuls. Everyone seemed to look externally for the piece to fill the puzzle, rather than look within. The name Vernon Adams became familiar to some for his heroics against Oregon State in 2013 — but unfamiliar to others, however. The Eastern Washington standout QB had accomplished so much at the smaller D-1 school, but felt he had more in the tank. With one thing leading to another, Adams agreed to transfer to Oregon upon graduation in June. For those that pay attention to college football, spring practice begins way before June is even in the picture. There are months of hard work and time put into learning the system before the summer hits. Players pour their blood, sweat and tears onto the practice field, all in an attempt to prove to the coaches that they deserve a shot in the Spring Game to show why they should then be considered a top prospect come summer time. Adams hasn’t had the time to do that, nor will he. You know who has though? Never hurts to learn from the best. No.8, now arguably the most famous number in Oregon football history had a companion the last few years. That companion learned from him, befriended him, and even traveled to Hawaii to visit his family with him. 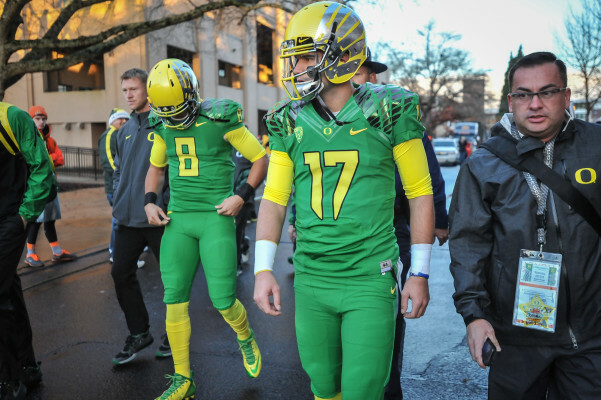 That companion, No.17, was, and still is Jeff Lockie. The companion is now ready to be the leader. I’ll be the first to admit that I bought into the Adams hype train. It’s easy to buy into hype when it comes from somewhere extraneous. I went into this game thinking no matter what happened, Adams was the guy. I was wrong, the world was wrong, everyone was wrong. In the game, Lockie threw for 223 yards and three TD’s. Numbers that no people in their right minds, other than the coaching staff, and maybe Lockie himself would have expected. And shovel it up, Royce. Lockie scanned the field as if he had been out there for a ton of time. The only time he got last year was garbage time thanks to the greatness that is our proud Tennessee Titan. Lockie commanded the offense, most certainly changing plays on the line of scrimmage to adjust to what the defense was showing him. The flea-flicker to Byron Marshall looked smoother than a video game. He shortly followed that off with a beautiful dump pass to the human wrecking ball himself, Royce Freeman. As the game went on and Lockie’s playing time extended, he continued to show why he is the guy for the job. It might have just been a Spring Game, and he might have been playing against a different defense than what the Ducks will have on the sidelines week one of the season, but that doesn’t matter. Lockie played the game just like he needed to. He stepped up to the plate, because that is exactly what needed to be done for this team. If nothing else, he proved that while Adams waits for his chance, the program is in good hands. He showed who the true field general was. Lockie stands 6’2″, and weighs about 205 pounds. He has the size of a prototypical college quarterback, and some athleticism to go along with that. In his senior year for Monte Vista High School in Danville, California Lockie excelled. He threw for 3,278 yards and 31 TD’s, with only eight INT’s. From analyzing some of his footage in high school, the instincts are there. One knock with backup QB’s is that they come on to the field and determine who they are going to throw the ball to before the play starts — this is due to lack of game experience. Because he has been a backup to Mariota for so long, it would not be fair to judge his time in college thus far (even though his 264 passing yards, one TD, and one INT are not bad). To be recruited to any major college football program, one must be great in high school. I agree with the staff that recruited Lockie, in that he had the ability to be a great QB at Oregon, and he re-kindled that fire yesterday. Lockie is no Mariota, nor am I ever claiming he will be. He has a solid arm, and good speed. He ran a 4.68 40-yard dash in high school, which has almost certainly gotten quicker in college. With the duo of Freeman and Thomas Tyner in the backfield this season, I think the offense will be more predicated towards the run. To go with the two bombs in the backfield, however, are many weapons that need to be fired. 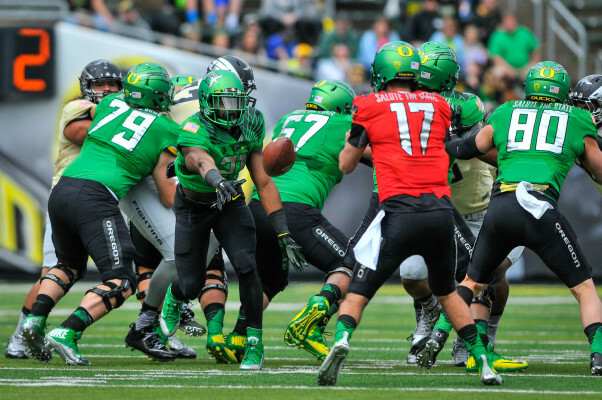 Weapons such as Devon Allen, Bralon Addison, Darren Carrington Jr, Byron Marshall, Dwayne Stanford …. and not to mention all the incredible freshmen recruits. Lockie showed that he has the ability to throw the ball today. I can’t say he has the ability to operate the spread like Mariota did, but what he lacks in athleticism will be made up for him around the field. Sat behind Mariota…. still contributed to the offense. It’s still very early on in the 2015-2016 college football season — some might argue it really hasn’t begun. On a bright note, Oregon has so much talent that it really does not know what to do with all of it. The QB position, at least for now with Mr. Lockie, has been filled. Just like I did very recently with Adams, I am ready to say Lockie has what it takes. He spent the last few years shadowing one of the greatest college QB’s ever to grace the field. Everything for Lockie has been building up, and he is waiting to cash in on so many years of patience and hard work. 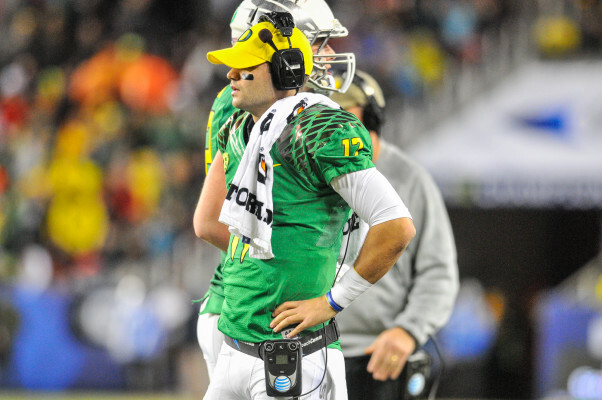 It will be interesting when Adams officially can practice with the Ducks, but he will be in for a serious dog fight. Just like the Athletic Department likes to hire within, our own in Lockie might be the one to lead us to the promised land.